CMYK composition equivalent to Pantone color Also known as “spot colors” or “pantone”, special colors are not the result of the CMYK blend. They are unique inks that allow you to faithfully reproduce the color. 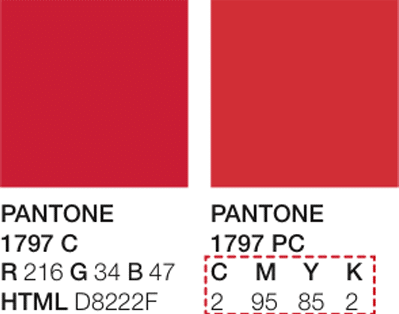 The Pantone scale is a world color system that uses codes to represent colors. The scale does not raise any doubt about the shades of blue, for example, because each shade of blue is represented by a unique code. Pantone can sometimes be printed in CMYK. In these cases, there is a CMYK composition equivalent to the Pantone color, as the image on the side illustrates. In white light there are three predominant colors: red, green and blue (Red – Green – Blue). These colors generate the RGB mode, which when divided into 255 levels, can generate more than 16 million colors. The RGB color mode is mainly used for the production of digital media files (screens and monitors). Bitmap programs use RGB mode as the default for pixel representation. Because it is light and not ink, RGB can not be used for printing. When converting an image from RGB to CMYK, there will always be some loss in color fidelity because RGB has a much higher number of color combinations. By combining all colors in RGB, the final result is white. This applies only to screen display because you can not compose white in ink (CMYK) printing. When working in RGB mode, we reverse the print logic. In CMYK we have the white paper and we use the colors to get to black. In RGB, the process is the inverse. when finalizing your art, check if there are elements in RGB or Pantone. A color scale will show equivalence in CMYK. For specific images, use programs like Adobe Photoshop to do the conversion.